The official awards ceremony with cash prizes for winning entries will take place on Friday 16th Nov at 7pm. The CWPAN COFFA ALUN EVANS MEMORIAL CUP will be awarded for what is, in the judges’ opinion, the best photograph in the competition. There will also be a “DO YOU AGREE WITH THE JUDGES PEOPLE’S VOTE”. Our challenge to you is to make a 5 minute film from script to screen in under ten days! 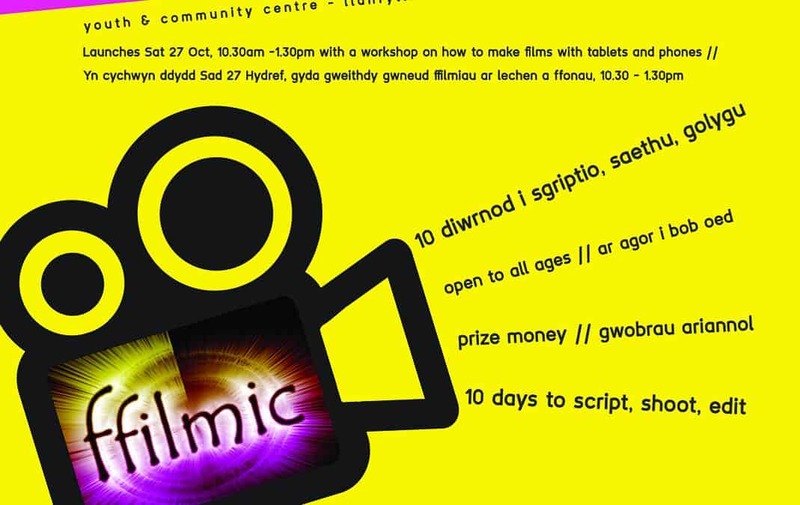 The Ffilmic Take 12 Film Challenge is open to all ages and abilities. It is FREE to enter and open to individuals and geoups, each team entering will receive 2 free passes to the premiere screening of the films. Come along at 10.30am to collect the secret elements which need to be in your film. If you are unable to attend we can email the elements to you. You can also stay for a film making workshop 10.30am – 1.30pm for beginners to intermediate showing you how to make films with Tablets, iPads and Smartphones. Bring your own handheld device or alternatively borrow one from us on the day. Every film completed within the Ffilmic Take 12 rules will be eligible for judging. This will be based on story, production values and adherence to genre. Selection of films will be screened at on Saturday 18th November Awards will also be given for a range of other categories. You must submit the relevant forms with your film on Tuesday 6th Nov – please note without release forms for your actors we may be unable to screen your film! Come and join us at the screening event where the winning films from each category will be announced and screened. Prizes will also be awarded These rules may be amended at any point. Your movie must be delivered no later than 5pm on Tuesday 6th November in one of the following formats: mov // avi // mp4 on a USB stick or via Dropbox, Googledrive, Wetransfer etc. This is an agreement between the Project Participant of Arts Connection. The Project Participant hereby agrees on behalf of him / herself and Team to take part in the Ffilmic Take 12 Film Challenge (hereafter called FT12). Project Participant has read and agrees on behalf of their team to abide by the rules of the project. It is understood that Arts Connection reserves the right to disqualify from screening and remove from consideration any films that do not adhere to these rules. Project Participant hereby understands that he / she is responsible for all crew, cast, equipment, sets, locations and other items necessary to partake in FT12 and all costs, expenses, damages and claims related to FT12. Project Participant hereby affirms that he / she will secure all rights (including without limitation copyrights) in and to all materials included in the Film, including without limitation any and all images, photographs, performances, appearance(s) by any person(s) and sounds, including the music. The Project Participant will obtain a signed Release from all persons appearing in the Film and for all those in the Team. Project Participant represents and warrants that he / she (a) is free to enter into this agreement, (b) that, except with regard to Arts Connection’s rights stated within, Project Participant is the sole copyright holder in and to the Film and (c) the Film does not to the best of the Project Participants knowledge violate the copyright of any person or entity, or defame or infringe upon any rights of any kind of and including the right of privacy, or any person or entity. Project Participant herby agrees to indemnify, defend and hold harmless Arts Connection, its owners, directors, employees from any and all claims, costs, damages, expenses ad liabilities including without limitation attorneys fees arising from the creation, production, use, exhibition, promotion, marketing, merchandising or other exploitation of the Film by Project Participant, Team and/or any member thereof, the Indemnified Parties and / or any of them (including without limitation claims for negligence and other torts, unauthorised use of likeness, invasion of right of privacy, publicity or personality or defamation, fraud, infringement of copyright and trademark, and breach of contract) and for an breach by Project Participant of any representation, warranty or obligation of Project Participant hereunder. Project Participant / Team and Arts Connection will jointly own, as coauthors, the copyright in and to the Film, and hereby agree the following divisions of rights: from the final day of the Project. a. Project Participant / Team shall have the non-exclusive rights to enter the Film into film festivals; to screen the Film at local film events, to stream the Film or any portion thereof on Project Participants personal website for internet viewing; to distribute the film for via DVD. b. Arts Connection shall have the non-exclusive rights: to screen, show, exhibit, telecast, broadcast, advertise, market, exploit, and disseminate the Film and / or any portion thereof throughout the universe in perpetuity, via any medium and in any manner whether now known or hereafter invented, including but not limited to theatrical, television (including without limitation all forms of broadcast, cable, and digital television), DVD, Internet distribution and any means of digital download. In no manner limiting the foregoing, Arts Connection shall have the right to use the Film in any portion thereof to advertise, promote and publicise Arts Connection in any manner and via any medium at Arts Connections sole discretion. Project Participant hereby acknowledges that participation in the Arts Connection FT12 is without remuneration or monetary compensation whatsoever. The consideration for participation in the project is the screening of Project Participants completed Film at the conclusion of the project; and the possibility, although not an obligation by FT12, for future screenings and distribution; and the opportunity for publicity or exposure for being a participant. Project Participant acknowledges and agrees that they are not an employee or agent of Arts Connection for any purpose, including all tax obligations, but that the parties are contractors independent of one another. Whilst every care will be taken with all material submitted, Arts Connection cannot accept responsibility for loss or damage. The Project Participant understands that they are to keep the master material and enter only a copy which will be non-returnable. FT12 accepts films in any language, although those in any other language than English must be subtitled in English, to ensure fairness in judging and also allow the film to be submitted either by Arts Connection or the Project Participant to further film festivals or distribution.